Every year at this time I get an email from someone who has seen a weird insect in their vegetable garden. They want to know what it is. Nine times out of ten it will be a European Mole Cricket Gryllotalpa gryllotalpa. They are actually quite abundant in the Touraine and Brenne in wet grasslands, vegetable gardens and irrigated crops, but rarely seen because they live underground and are nocturnal. 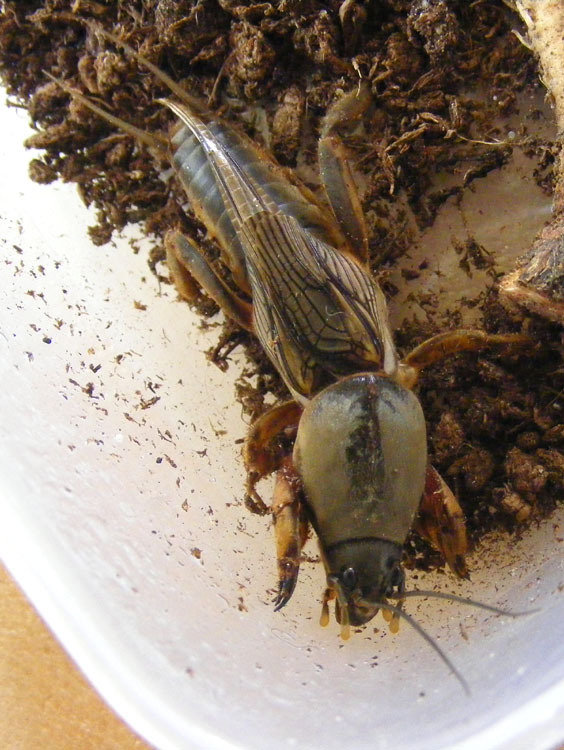 They are called Mole Crickets for fairly obvious reasons: they are covered in thick downy hair reminiscent of moleskin, and they have clawed shovel like front feet for digging. Although their wings look truncated they can fly. Their hind legs are not used for jumping but for pushing soil out of the way. As well as being weird looking they are quite large, up to 5cm long, which is why people notice them if they dig them up in the veggie garden. They eat fleshy roots and fellow soil dwelling invertebrates such as grubs. In turn, they are eaten by birds, shrews, moles and ground beetles. Their French name is la Courtilière commune. There is at least one other species of Mole Cricket that is very likely present in Indre et Loire. This species is paler than G. gryllotalpa and was only named and described in 1970, after an entomologist realised it was a different species because its very loud and distinctive chirp was different. 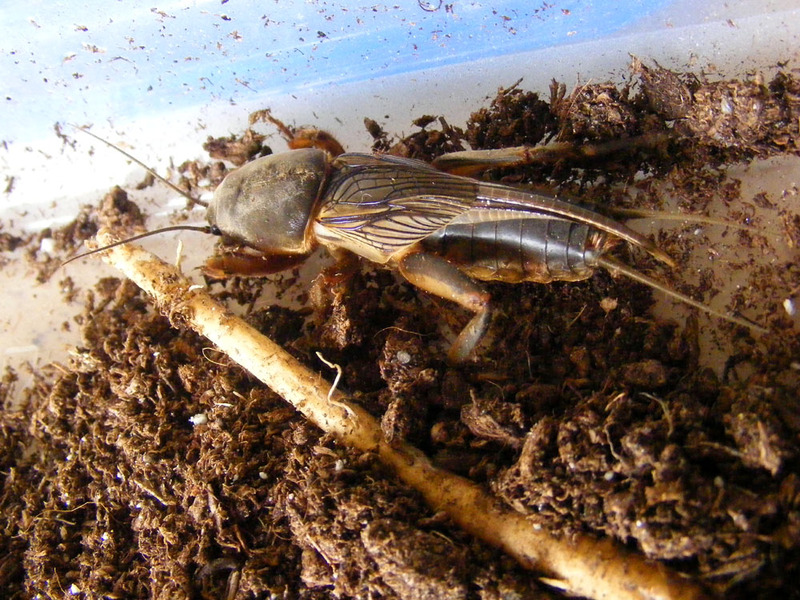 The new species is known as the Vineyard Mole Cricket G. vineae (Fr. Courtilière des vignes), and it has the distinction of being able to make the loudest sound of any insect. 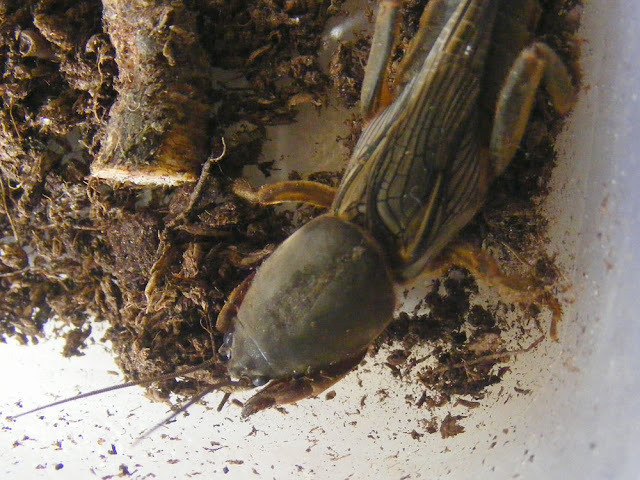 Mole Crickets 'sing' by rubbing their wings together using a technique called stridulation. Many thanks to Tim of Aigronne Valley Wildlife for the opportunity to photograph this specimen. It fell into his moth trap one night and he kept it until I could get over there and take photos. What you didn't mention was the crickets [in general] amplification system.... they excavate a shallow bowl at the entrance to the burrow and stridulate in the bowl... this adds the echos to the sound they make, by reflection.